VIETNAMESE MEDIC ULTRASOUND: CASE 145: MALIGNANT OVARIAN TUMOR ?, Dr PHAN THANH HẢI, MEDIC MEDICAL CENTER, HCMC, VIETNAM. CASE 145: MALIGNANT OVARIAN TUMOR ?, Dr PHAN THANH HẢI, MEDIC MEDICAL CENTER, HCMC, VIETNAM. WOMAN 26YO, SINGLE, HYPOGASTRIC DISTENTION. ABDOMEN ULTRASOUND SCAN OVER HER PELVIS DETECTED ONE 20CM MASS FROM PUBIS TO UMBILICAL REGION, BIG, CYSTIC, MULTILOCULATED WITH SEPTATION. IT DEPLACED UTERUS TO LEFT SIDE. IMAGE 1: LONGITUDINAL SCAN OVER PELVIS FROM UMBILICUS TO PUBIS, THE MASS WAS MULTILOCULATED CYSTIC PATTERN. IMAGE 002: COLOR DOPPLER SHOWED LOW VASCULAR SUPPLY, AND NO VEGETATION ON THE SEPTATION . IMAGE 003: STRUCTURE OF CENTRAL PART OF THIS MASS WAS SOLID, HYPERECHOIC, LIKE FATTY TISSUE. BLOOD TESTS= AFP, BETA HCG WERE NORMAL, CA125=175UI [ N<35]UI. ROMA TEST WAS IN HIGHT RISK VALUE. FOR MORE INFORMATION, MRI WAS DONE WITH GADO CE. IT SHOWED THIS TUMOR CYSTIC MULTILOCATED CONTAINING HYPERPROTEIN FLUID AND FATTY TISSUE WITHOUT CALCIFICATION. WITH MRI RADIOLOGIST SUSPECTED TERATOMA OF OVARY. 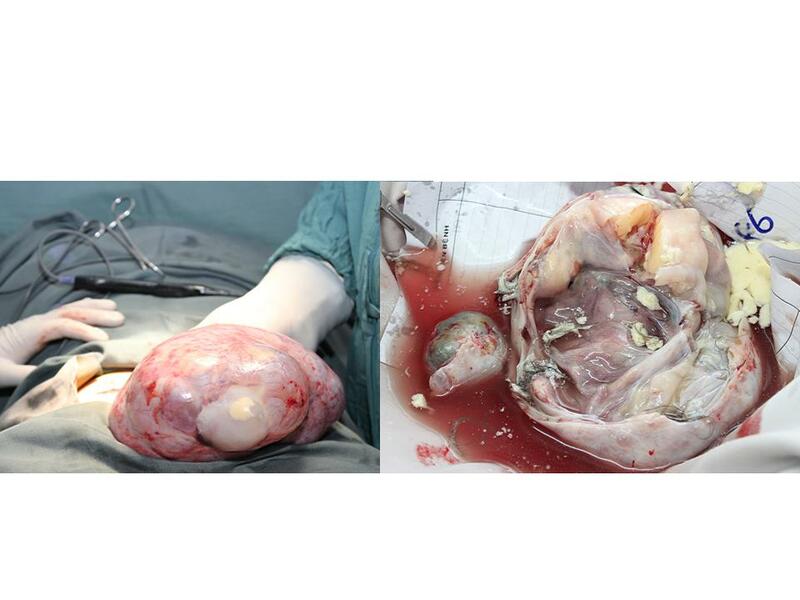 LAPAROTOMY OPERATION WAS DONE AT HUNG VUONG HOSPITAL TO REMOVE HUGE OVARIAN TUMOR, WITH HAIR AND POLYMORPHIC TISSUES . MICROSCOPIC REPORT IS MATURE TERATOMA.